Hello, students! Are you looking for apps to help you keep a schedule, organize notes, and crunch numbers? You've come to the right place. Aris Grigoriou, the Student Recruitment Manager at Study Medicine Europe, sent us this great and informative infographic that's full of great suggestions for Android and iOS applications in help of students. 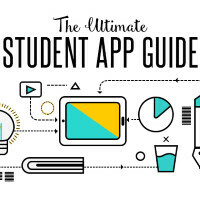 It offers students some of the best apps available to aid with studies, note taking, and revision. For example, Easybib is an app that automatically creates citations from your bibliography in over 7,000 citation styles, just by scanning a book. The infographic and links to the Android and iOS app stores are available in the slideshow below. Check it out, it's good stuff! All live a lot to be desired when you realize the uses of OneNote (bit.ly/1Hruf8o).